A dazzling foray into the exacting world of nightly television news, Broadcast News is triumphant combination of pragmatic drama, humour, and romance set in a charged workplace. At a high profile Washington DC network television station, Aaron Altman (Albert Brooks) is a well-regarded journalist still hoping for a chance to take over the anchor chair. His best friend is producer Jane Craig (Holly Hunter), who is equally smart and career driven, but suffering from stress due to an unbalanced life of all work and no play. Aaron and Jane believe in the old-fashioned principles of news being about the news and not about celebrities and pretty faces. Their world is rocked when handsome dunce Tom Grunick (William Hurt) is hired as the new anchor for the nightly news show. With a background in sports and no understanding of world affairs, Tom is Aaron and Jane's worst nightmare. But Tom does prove himself to be a good anchor, and despite herself, Jane falls in love with him, threatening her friendship with Aaron. With the station in an upheaval due to impending staff cuts, the professional and personal lives of Aaron, Jane and Tom are thrown into turmoil. Written and directed by James L. Brooks, Broadcast News is one of the smartest movies to come out of the 1980s, with crisp dialogue, episodes of broad humour, and ultimately a human-centred drama about ordinary lives subjected to high stress in an evolving industry. The spiritual sequel to Network (1976), Broadcast News is an equally excellent trip through the world of television news. But while Network was still all about fighting the good fight against news yielding to commercial interests, Broadcast News understands that the fight is lost and nobody cares. The barbarians are inside the gate, and Aaron goes as far as likening Tom to the devil himself, disguised as a handsome charm merchant, taking over in front of the camera to satisfy aesthetic sensibilities despite knowing nothing about journalism. Meanwhile, when Jane stands up to give a rousing talk about defending the principles of good newscasts, the audience of fellow journalists cannot empty the room fast enough. Broadcast News is also smart enough to give the devil his due. When Aaron turns to Tom for tips on how to succeed in front of the camera, Tom is suddenly is in his element, and yes, the uninformed simpleton knows what it takes to be a star anchor. Aaron finally realizes that being the high profile face of the news is an altogether different profession than being a journalist, and his dream of both finding and presenting the news is a generation too old. In addition to presenting an inside look at the exhilarating world of assembling a nightly news show, Brooks enjoys serving up his tasty romantic triangle, and takes a thoughtful stance on the parallels between love and life. In an example of dazzling writing and directing, the most romantic scene has nothing to do with physical closeness. Jane and Tom connect as he successfully anchors emergency coverage of an emerging crisis in real time, Jane producing the segment, communicating with Tom through an earpiece, and pushing the buttons that make it all work. The cerebral Jane ultimately falls for the dishy Tom in a hurry, leaving the earnest Aaron sidelined in friendship hell. And if even Jane can be seduced by style over substance, there is nothing left to defend: the news industry stands no chance, and has to offer up the pizazz to maintain the love of an audience much less intelligent than Jane. 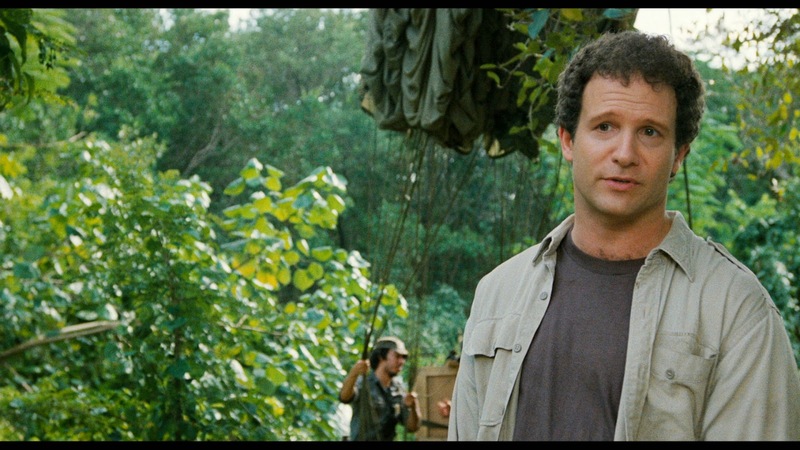 Albert Brooks and Holly Hunter deliver the definitive performances of their careers. Brooks gives Aaron the caustic voice of brains over beauty, the smartest kid in the room still not quite understanding that it takes a lot more than smarts to succeed. Hunter never had a better role than Jane, written by Brooks at the most well-rounded character in the film. Hunter perfectly occupies the space where the studiously organized Jane even schedules her crying breaks, and otherwise rolls through her career with a voracious appetite that leaves hardly any room for a personal life but plenty of opportunities for spectacular successes in the production booth. William Hurt has possibly the most difficult role, and plays Tom as a self-aware handsome face, under no illusions that career doors are opening due to superficial reasons. But among the three lead characters, Tom is perhaps the most in tune with where the television industry is headed. If he ever had any illusions he has long since replaced them with a willingness to ride the wave running in his favour. Robert Prosky as the executive producer of the news show and Jack Nicholson as the network's star self-aggrandized New York-based anchor provide weighty support. Lois Chiles and Joan Cusack round out a terrific cast. 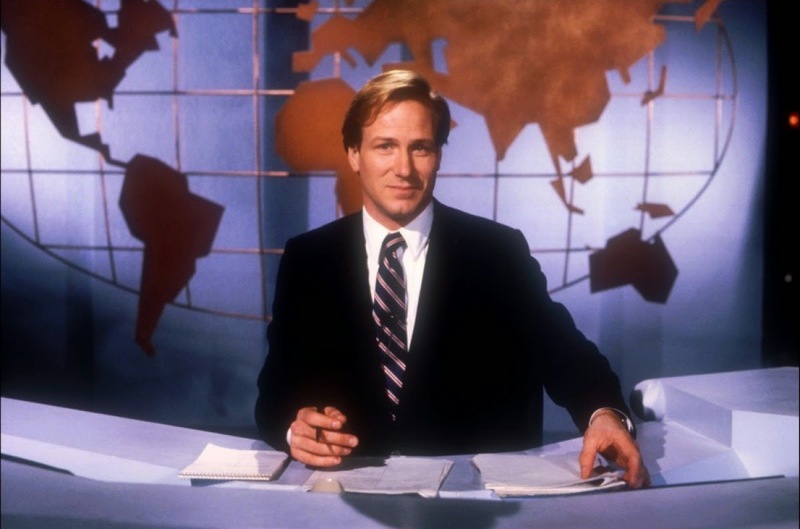 Brainy, lively, and playful, Broadcast News is a ratings winner.